There are 7 months to go until RTN 2015 starts in Inverness. This is the first in a series of monthly Newsletters which are designed to inform you, update you …and as the weeks and months pass, to make you think “oh Sh*t, I’d better get training”! Have You Changed Your Mind?? Each year RTN has been delivered with a partner charity. It is not a charity event (none of the charities we work with are asked/allowed to make any financial contribution to running the event), but I want to be clear that our charity partners are at the heart of the event – maybe you will support them, but you will certainly gain an appreciation of what they do. This year, we are delighted to be working with The Sandpiper Trust as our charity partner. 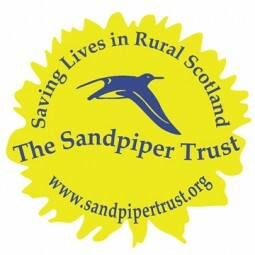 Sandpiper work with medical professionals to help deliver pre-hospital emergency care throughout rural Scotland (see http://www.sandpipertrust.org/). For an event which takes place in, and is generously supported by, rural communities, the work of The Sandpiper Trust seemed like a great fit. As a RTN participant, the data you (or someone else!) entered at registration is held on our database. 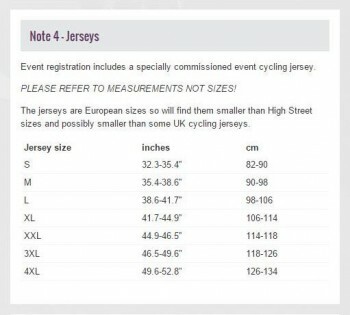 With 850 customers, we want you to take care of any updates – so if you move home, want to change your start time, want to check your jersey size (see below), then you can login to your account here http://www.ride-the-north.co.uk/login and enter your email (the one that your received the link to this newsletter on) and the password which was contained in the registration email. This year we have a password reset if you don’t have the original password to hand. Your event registration includes a bespoke event jersey – thanks to the kind support of our sponsors. As numbers grow, the event jersey order has to be placed earlier …and that means we can get them out to you in early summer. Past participants will know that our supplier uses European sizes and that these sizes are smaller than what some of us are used to. PLEASE order according to chest measurement and not the S,M,L labels. Your size will have been entered at registration and the chart shown below was shown on the registration page. This information can be edited at any time (follow instructions in note above!) up until the order date – which I am now setting as 9 March 2015. We will order according to the size entered in your account, which means it isn’t possible to swap ill-fitting jerseys (unless you get lucky on the Swap Shop noticeboard)! Every year the RTN route has changed and 2015 will present some new challenges. The final route is agreed over a lengthy dialogue with Local Authorities and Police and will be published much nearer the time (there have been road issues in previous years which mean I prefer to have a working route, but to issue maps and files about 2 weeks out). My honest view is that there are two tough days ahead. Day One will feature the most challenging section of road we have featured so far, but with an easier afternoon. The second day (even with the omission of the regular climb up Suie) will feature a greater total ascent than any previous RTN day. Overall, I estimate that this year’s route will be a teensy bit tougher than 2014 …but this time with scorching sun and following winds of course! This year’s event is finishing in Stonehaven rather than Aberdeen. This is a throw-back to the very first RTN in 2011 which finished in Stonehaven and is also an acknowledgement of the support we have had from the local community (over 100 riders this year). More details of the route and the finish will be made known in these newsletters as we go forward. You might already know that booking accommodation for the overnight in the middle of the event (28 August) can be challenging. We will be providing transport to accommodation in Elgin and to central points in Lossiemouth, Forres, Fochabers, Findhorn and the route will pass the camping option at The Loft near Kinloss. There will be further updates/suggestions about accommodation over the months ahead and I would recommend the event Facebook Page (see below) on which I expect to post any relevant news. OK, I know not everyone is on Facebook, but this might just be the moment to change your mind! 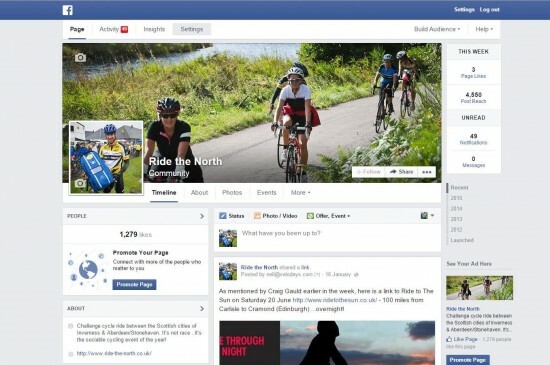 The event Facebook page can be pretty useful for updates about the event, cycling generally across North Scotland and just for connecting with other participants. You can find it here https://www.facebook.com/inverness.to.aberdeen and ‘like’ it to make sure you get notified of new posts. As ever, you are guaranteed 15 seconds of fame on Facebook & Twitter if you send a picture of your cycling adventures wearing a RTN jersey!